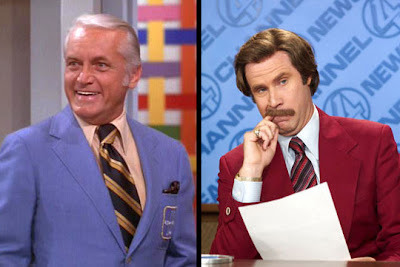 Although Ferrell got the idea for “Anchorman” while watching a documentary about female newscasters in the 1970s, there’s small doubt that he drew more than a little inspiration from the egomaniacal anchor played to the hilt by Ted Knight from 1970 - 77. Created by James L. Brooks and Allan Burns, “The Mary Tyler Moore Show” similarly dealt with the difficulties of being a female in a traditionally male workplace, but from the perspective of Mary Richards, a thirty-something woman fresh out of a bad breakup, making a new life in a new city in a new era. While she was treated as an equal by some people in the office, Ted Baxter was not one of them. Pompous, vain and vapid, Ted Baxter was threatened by just about everyone in the office, from the far more confident sports anchor Gordy (played by John Amos) to the much smarter newswriter Murray (Gavin Mcleod). But the arrival of a female with authority over him was sometimes more than poor Ted could stand. In “Anchorman,” Ron Burgundy’s vocal inflection owes much to the pretentious baritone of Ted Knight (a voice he also used as the narrator for “Super Friends ”). But Ted Baxter’s arrogance masked an insecurity that Burgundy seems to lack. Actually,, the original concept of Ted Baxter was more akin to Ron Burgundy. Ted was originally written as a younger, tall, dark, handsome love interest for Mary (early episodes of the show even contained dialogue about how devastatingly good looking Ted was). Soap opera actor John Aniston (yes, Jennifer’s father) was one of the original choices for Ted, and photos of Aniston at that age look eerily ronburgundyesque, big ol’ mustache and all. While “Anchorman” tries (although not too hard) to capture the time period of the 1970s, “The Mary Tyler Moore Show” WAS the seventies, encapsulated. Not in a campy, astroturfed “Brady Bunch ” kinda way, but in a much more realistic earth tonal vein. Not that there was a dearth of polyester pantsuits, shaggy coifs and shaggier carpeting... oh, they were there (who can forget the episode where Rhoda got lost in Mary’s deep pile rug?). It was an era when you could keep a bottle of whiskey... or scotch...scotchy scotch scotch... in your desk drawer (as Mary’s boss Lou Grant did) without eliciting concern from Human Resources. The feminist movement was in full force and for the first time, a woman desiring a career over hubby and kids didn’t seem freaky. The evolution of Mary Richards from tentative girl Friday to confident woman producer mirrored what was happening in the workplace in the 1970s. The kind of overt sexism on display in “Anchorman” and early seasons of “MTM” just wasn’t acceptable by the time Jimmy Carter was in office. That’s not to say that TV news was at a journalistic zenith by the end of the decade. The seventies can be considered in some ways the Mesozoic era of technology and media. CNN wouldn’t hit until 1980, but the notion of news as entertainment and its presenters as celebrities was starting to take root. Brooks would tackle this issue again with his 1987 film, “Broadcast News ,” starring William Hurt as a rising anchorman with lots of charm, but little journalistic credibility. And really, today, are things much better? While the media is savvy enough to maintain a level of political correctness in what it says out loud, there’s a level of superficiality within today’s news (local, network and cable) that keeps both Ted Baxter and Ron Burgundy from seeming the antiquated dinosaurs they should. In some ways, they’re almost quaint precursors to the modelesque mannequins who read the teleprompters today.